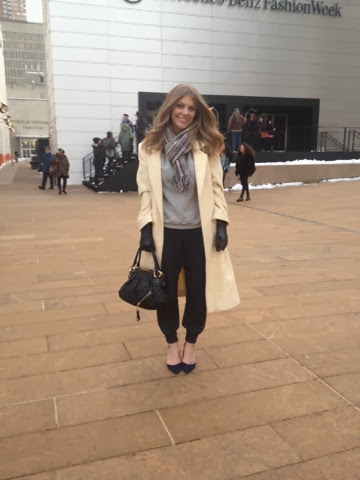 First Came Fashion: MBFW // Keeping Cozy. Delirium may have been setting in right at this point. I had just arrived to New York on a red eye, headed straight to the hotel, got myself looking somewhat presentable and bee lined it to Lincoln Center for some shows. Somewhere between landing and stepping out of the car at Lincoln Center, I convinced myself it was completely appropriate to wear modified sweatpants to fashion week, which is exactly what I did and savored every comfy moment of it. I just can't get enough of the New York fashion vibe - any goes, as long as you wear it with confidence. Labels: Charles Jourdan., Everlane., Marc Jacobs., Missoni., New York Fashion Week., New York., Nordstrom., Talbots., Zara.